Tucson Country Club provides members a unique golfing experience and outstanding social activities. Tucson Country Club is located in the Catalina Foothills. TCC was established in 1947 in a, then, remote area of Tucson. The beautiful golf course is complemented with a driving range and practice greens. See ALL Tucson Country Club Homes for Sale! 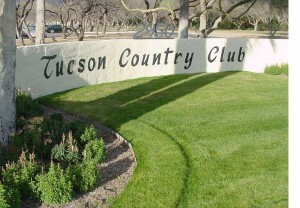 The mission of Tucson Country Club is to enrich the lives of its members. TCC provides a unique golfing experience along with exceptional recreational and social activities. It strives to friendship and fellowship within a private, member-owned setting. A tennis facility with 11 courts is available. The aquatic facility features a 6 lane salt water lap pool. A family pool has a 97 feet double loop water slide. There is also a water slide for younger members. The Lap Pool is heated year round. Tucson Country Club is one of the few “Grand Old Gems” left in the world of golf. Poised in the middle of the Sonoran Desert, stately trees rise to the heights of one hundred thirty feet above her fairways, regally gracing her grounds. To the North, East and Southeast, she is bordered by magnificent and imposing mountain views. The 18-hole course (7000+ yards) is tree-lined, in a Midwestern style of design. And, it is the best walking course in Tucson, with nature’s abundant creatures surviving and thriving in this area. Looking for Tucson AZ Real Estate For Sale? We can help! Questions about Tucson Homes, Tucson Real Estate Market or Tucson Country Club Homes for Sale? Call Us 866 316 5575 OR complete the CONTACT FORM and we will get right back to you!